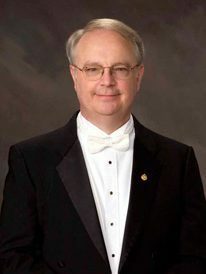 Since 1982, Dr. John R. Locke has served on the UNCG College of Visual and Performing Arts Faculty as Director of Bands, Director of Summer Music Camps, conductor of the Wind Ensemble, and conducting teacher. He holds the Bachelor and Master of Music degrees from West Virginia University and the Doctor of Education degree from the University of Illinois. Prior to his arrival in North Carolina, Dr. Locke held teaching positions in music at West Virginia University, Southeast Missouri State University, and the University of Illinois. He has conducted band performances throughout the country including National Conventions of the MENC, CBDNA, ABA, the Kennedy Center in Washington, D.C., the Strathmore Center in Washington, DC, and Lincoln Center in New York City. Twice, the UNCG Wind Ensemble earned critical acclaim from The Washington Post newspaper following concert performances in the nation’s capital. Under Locke’s leadership, the UNCG Wind Ensemble has released 16 commercially available compact discs including fireworks! which was a Grammy Entry List 2011 CD in two categories, “Classical Album of the Year” and “Best Orchestral Performance.” In addition, he has guest conducted the U.S. Air Force Band, U.S. Army Field Band, U.S. Navy Band, “The President’s Own” U.S. Marine Band, the Dallas Wind Symphony, as well as numerous university bands and all-state honor bands. Dr. Locke has served as Editor of The North Carolina Music Educator and has published articles on band and wind ensemble literature in the Journal of Band Research and in Winds Quarterly. He is Past-President of the North Carolina Music Educators Association representing 2,200 members. Dr. Locke is a recipient of Phi Mu Alpha’s Orpheus Award and has received the National Band Association Citation of Excellence on three occasions. He is a National Arts Associate of Sigma Alpha Iota. In 1989, Dr. Locke was among the youngest conductors ever to be elected to membership in the prestigious American Bandmasters Association. In 1994, he received the Phi Beta Mu International Fraternity Outstanding Bandmaster of the Year Award, presented at the Mid-West International Band Clinic in Chicago. Dr. Locke is Past-President of the Southern Division of College Band Directors National Association and hosted the Southern Division Convention at UNCG in February 2000. In 2002, Dr. Locke was nominated for the O. Max Gardner Award, the highest award in the 16-campus UNC System. He also received the “Outstanding Music Teacher Award” in the UNCG School of Music in 2003. In 2005, Dr. Locke was elected President of the American Bandmasters Association and received the Albert Austin Harding Award from the American School Band Directors Association. In 2007, he received The Old North State Award from NC Governor Mike Easley “for dedication and service beyond excellence to the state of North Carolina.” In 2009, Locke became Editor of the Journal of Band Research, a scholarly publication begun in 1962. In July 2012, Locke was honored by NC Governor Beverly Perdue with The Order of the Longleaf Pine Award, the highest civilian honor in North Carolina. In 2014, Locke was named the Marion Stedman Covington Stedman Distinguished Professor of Music at UNCG. At UNCG, Dr. Locke is the founder and director of the Summer Music Camp program, now the largest university music camp in America, enrolling over 1,820 students annually and served by a staff of 160 professionals. He is also the founder of the Carolina Band Festival and Conductors Conference. Since 1977, he has administered summer music camps for over 63,000 students. He is in constant demand as a guest conductor, clinician, and adjudicator for band festivals throughout the United States and Canada.